With a clean and casual case design bathed in a warm nutmeg finish, you'll love having this end table in your living space. As storage goes, you receive three removable wood baskets for a stylish storage option, as well as a middle shelf for a beautiful display area. 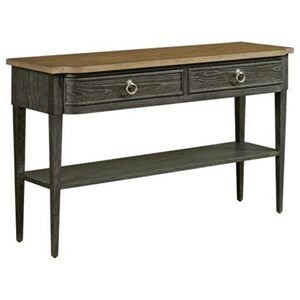 The Stratton Rectangular Sofa Table with 3 Wood Storage Baskets by Magnussen Home at Stoney Creek Furniture in the Toronto, Hamilton, Vaughan, Stoney Creek, Ontario area. Product availability may vary. Contact us for the most current availability on this product. Welcome relaxed, rustic charm into your living space with this collection, which includes plenty of functionalities to maximize your storage needs. 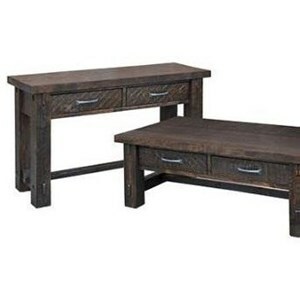 The Stratton collection is a great option if you are looking for Rustic furniture in the Toronto, Hamilton, Vaughan, Stoney Creek, Ontario area. Browse other items in the Stratton collection from Stoney Creek Furniture in the Toronto, Hamilton, Vaughan, Stoney Creek, Ontario area.